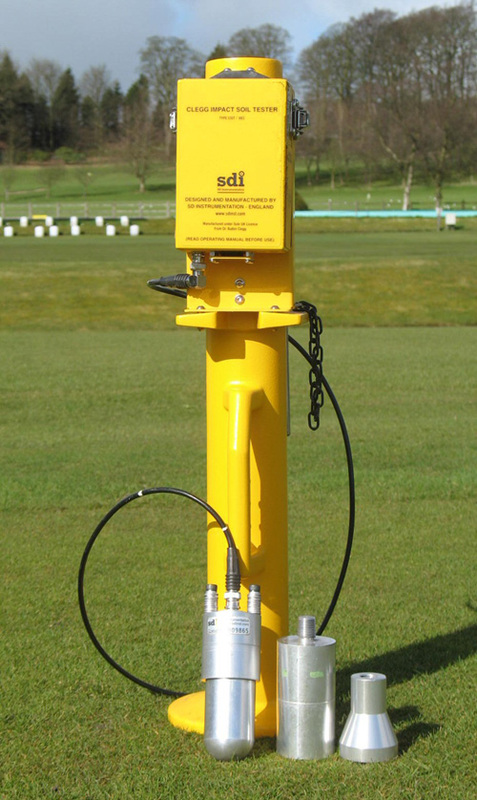 The CIST/883 Golf Course Tester designed and manufactured by SD Instrumentation Ltd provides an easy and straightforward means for measuring the variations in strength on fairways and for helping determine the uniformity of an area. The equipment consists of a two 0.5 Kg hammer probes that operate independently within a vertical guide tube. 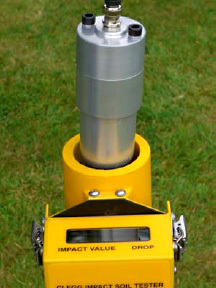 A golf ball size dome probe and a flat ended probe are provided with the system. The probe falls through the guide tube when released and strikes the surface under test, decelerating at a rate determined by the stiffness of the golf course surface within the region of impact. The readout is clamped to the guide tube and the displayed reading is viewed from the top during use. Single button operation design provided for easy use. The sports pitch or golf fairway hardness is easily measured and the results displayed and stored are useful predictors of ball bounce and roll during play. Variations in strength of the fairways may be due to construction processes such as compaction and stabilisation, environmental effects such as moisture content changes and also to compaction differences caused by a particular usage in a specific location. 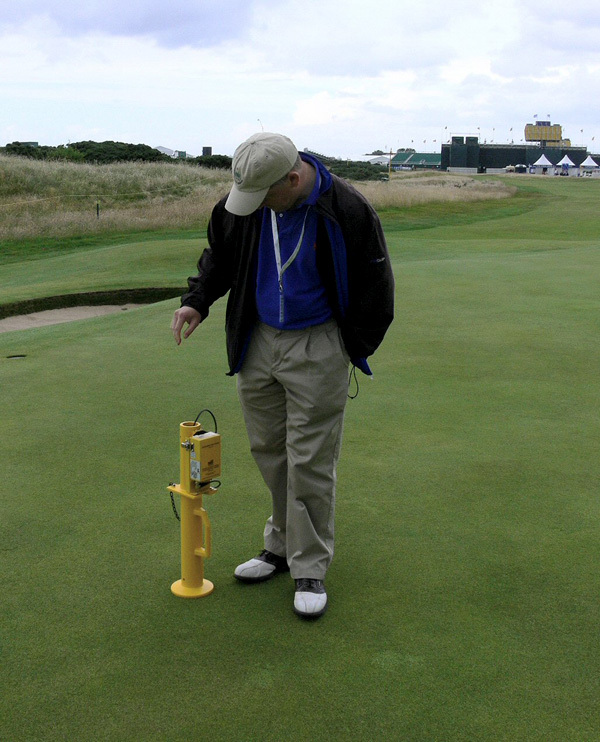 The Tester provides a quick and accurate method for monitoring variations in strength and for helping to determine the uniformity of an area. An example of its simplest application is to help determine soft spots or hard areas. 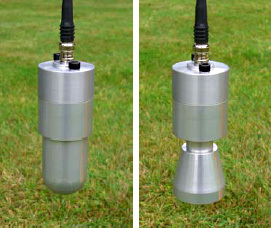 The Tester consists of a pair of 0.5 Kg sensor probes. The two probes are shown on the right. The left-hand one is the domed probe whose diameter is the same as a golf ball. The right-hand probe has a flat face of diameter 50mm. Both probes are provided with the equipment allowing for different testing regimes. The chosen probe is placed in the guide tube and supported by the cable. When released it falls through the guide tube and strikes the surface under test, decelerating at a rate determined by the stiffness of the material within the region of impact. 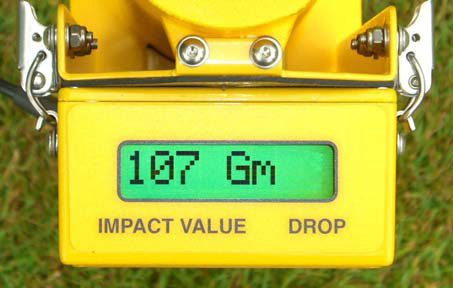 The readout registers the hardness values in units of Gravities (Gm). The Gm value is an indication of soil strength. Carrying out a test is quick and straightforward. The guide tube is placed in position vertically on the surface to test. The digital readout is located on the guide tube during testing allowing easy use as there is no need to hold the readout in the hand. The probe is raised by its cable so that it reaches the top of the guide tube. The probe is then allowed to fall freely. The reading is recorded in the readout unit and displayed on the display. An example test of 107 Gm is shown being displayed by the readout in the picture just above on the right. The stiffness - or ‘hardness’ of the surface as related to ball bounce and roll can be quickly established and it is easy to monitor stiffness changes due to moisture changes, grass growth and wear throughout playing seasons. Typically, readings less than 75 indicate a soft surface and those around 100 indicate a well controlled surface for excellent ball striking and accurate play. The test data is recorded in the instrument and it is downloadable to a computer wirelessly by Bluetooth. Golf:- 42.7mm diameter dome 0.5 Kg. Flat: 50mm diameter flat 0.5 Kg. 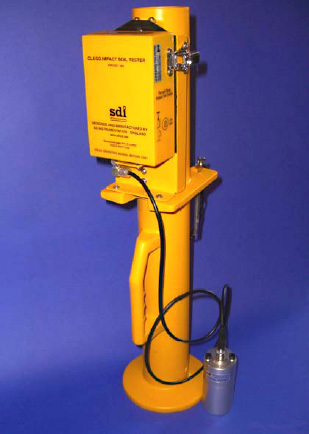 Additional 0.5 Kg mass attachment allows 1 Kg tests to be completed. readings and time & date of each test. packages such as Microsoft Excel™. 9,999 drop test storage & output. 60 x 13 x 13 cm. Instrument weight 2.9 Kg. Packed weight in case 8.5 Kg.